In the list of the world's best diets, there is the DASH diet that has been the best for a number of years. Doctors say that it's the most effective diet that can strengthen one's health. According to the doctors of the National Institutes of Health, the DASH diet scores 3.3 points out of 5 in the "Weight Loss Effectiveness" category and 4.5 points out of 5 in the "Health Usefulness" category. DASH (Dietary Approaches to Stop Hypertension) is a diet developed specially for blood pressure reduction when a person experiences hypertension. 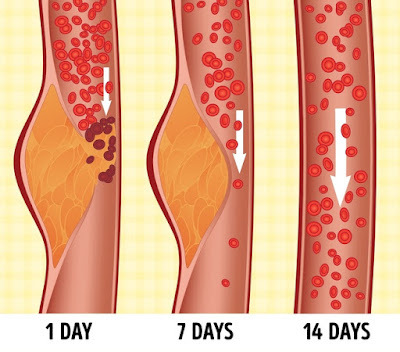 But later, scientists understood that this diet resolves many other important problems: cholesterol level reduction, stroke and heart failure prevention, and weight normalization. What is more, this diet is the best diet to prevent diabetes. What's the concept of the DASH diet? All of the necessary components (calcium, proteins, vegetable fiber) that are responsible for the functioning of the brain and the internal organs, as well as hair and skin health, are balanced in this diet. It's also convenient because you don't have to calculate and monitor each component: you just need to eat certain recommended products (fruit, vegetables, grain products, protein-containing foods, and dairy products) and reduce the quantity of salt in dishes. The main feature of the DASH diet in comparison with other diets is that it was developed for people who have to take care of their diet throughout their lives. That's why you don't need to put up with hunger: you can afford various and tasty dishes. You just need to keep in mind several basic rules. Drink 2 liters (67 fl oz) of fluid per day. Eat 5 times per day. 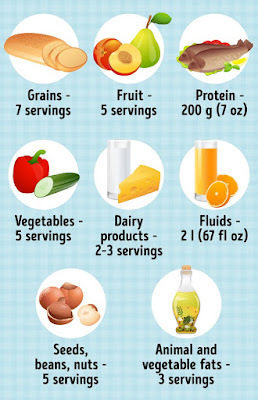 One serving's weight should be no more than 215 g (8.80 oz). Daily calorie intake: around 2,000-2,500 kcal. Sweets: no more than 5 times a week. Try to eat more cereals, seeds, beans, lean meat, and vegetables. 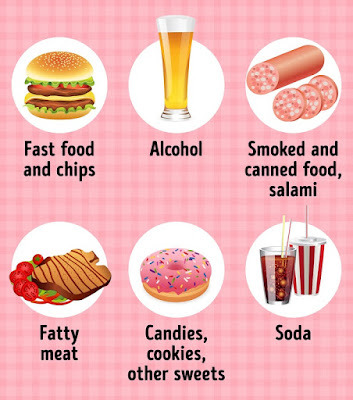 You should avoid drinking soda or alcohol. You can have no more than 8 snacks per day (in addition to basic meals.) But have a bite only if you're really hungry. Alcohol and tobacco are prohibited. Reduce salt and consume up to 2-3 tsp per day. Your diet should include whole wheat bread. Exclude smoked or fatty foods, pickles, pastry, canned fish, and meat. According to the DASH diet, to form a proper diet you should mind your goals: whether you want to lose weight or to become healthier. If you want to lose some weight, your menu should contain fewer calories. In other words, you need to reduce the servings. Protein: 0.2 kg (7 oz) of lean meat or fish, eggs. Of course, we have to avoid all of the typical "unhealthy" products. You can eliminate harmful products step-by-step and finally, the urge to eat forbidden foods will disappear. You can create your own menu by taking into consideration the diet's rules and the products that you're allowed to eat. You don't have to do anything special to create your diet: you just need to include necessary products and exclude the "bad" ones gradually. If your goal is to lose weight, cut the amount of recommended servings. You can also find various tasty dishes that are appropriate for the DASH diet on the Internet. The DASH diet is an easy, safe, and useful diet that can help you feel better and get rid of excess weight. Such a diet provides the necessary amount of microelements and vitamins to your body and there are no time frames for you to follow this diet. You can lose weight smoothly and without experiencing hunger or sudden fluctuations in weight. And this means that your body won't be stressed.